The St. Louis Cardinals always seem to have an ace in the hole. This time around, their top card may just be the most talented offensive prospect in the game. His name is Oscar Taveras. He's a 21-year-old outfielder who is recognized by both MLB.com and Baseball America as the No. 3 prospect in the game. And according to Derrick Goold of the St. Louis Post-Dispatch, he's on his way to the big leagues and expected to be in the Cardinals lineup on Saturday against the San Francisco Giants. The Cardinals scrambled to promote Taveras from Class AAA Memphis for today’s game after they learned slugger Matt Adams will be sidelined for at least a week by a calf strain. Sources confirmed the promotion to the Post-Dispatch during Friday’s 9-4 loss to the San Francisco Giants, and manager Mike Matheny announced the roster move in his postgame comments. Taveras will wear No. 18, and he’s expected to start this afternoon. The Randal Cardinals manager Mike Matheny references is 22-year-old outfielder Randal Grichuk, who was officially recalled for his second stint with the big club on Friday. He's expected to log time in center field. 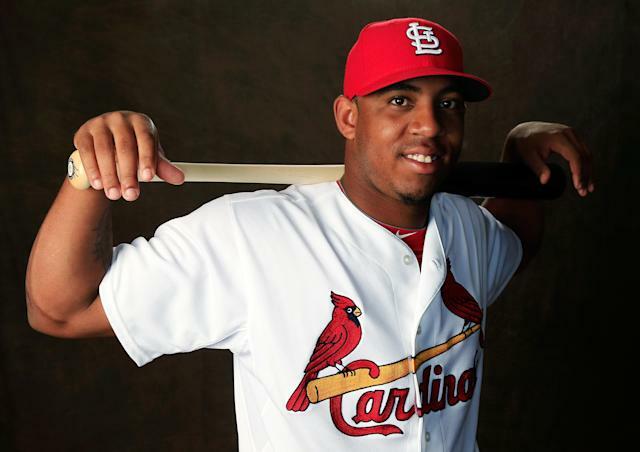 The big news though is the arrival of Taveras, who was putting together a marvelous season at Triple-A Memphis. Through 49 games, he hit .325/.373/.525 with seven homers and 40 RBIs. He's already played in parts of six minor league seasons after being signed out of the Dominican Republic in 2008, so he's definitely put in his time and done very well overall, hitting .321/.377/.519 lifetime. You can tell in the consistency of those numbers that there's really nothing left for him to prove in the minors. There's no challenge left there because the pitchers at the Triple A level simply don't have any answers for getting him out. The time to take his hacks and test his skills against the best pitchers in the world has come. It's also time for the Cardinals to see where Taveras fits in the lineup in the short term. In the long term, he's viewed as the Cardinals best hitting prospect since Albert Pujols, so barring something unforeseen he'll be hitting in the middle of Mike Matheny's order well into the 2020's. As for where he'll play defensively, Taveras has the skills to man all three outfield positions, but will likely settle into a corner outfield position initially. Regardless of where he plays or where he hits, this is just a fun time to be a baseball fan. Anytime one of the players viewed as the future of the game finally arrives, it's special, and should be enjoyed. Taveras certainly fits that bill, and he may just be the first of the bunch as the Pittsburgh Pirates are expected to recall top outfield prospect in Gregory Polanco in the coming weeks.